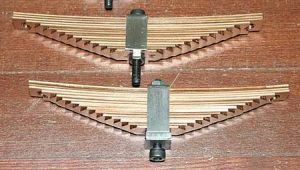 Leaf springs are not as difficult to make as sometimes thought, and can be made in the home workshop quite successfully. However, there are several things that should be observed to make them. The spring steel used as the raw material is a carbon steel and 'hard', and cannot usually be machined, drilled or formed successfully while in the hard state. The material must be annealed first before working on it. After completion, the spring is then hardened and tempered. When tempered, the material can be cut, drilled, punched, filed, rolled, bent, etc to the desired shape. After forming and hardening/tempering, the springs are then assembled from the individual leaves. Central rivet to fix leaves. Leaf springs, by their nature, tend to separate and fall apart, and must be held together, usually by a rivet (copper, brass or soft mild steel) through a hole drilled in the centre of each leaf. Sometimes, a strap, or screw compression fitting, around the assembly is used. The raw material is flat strip of spring steel. This can be obtained from some model suppliers, but it may also be worthwhile looking at the clock making/restoring fraternity, who do exactly the same thing, but with clock springs. Search the Internet for "clock making", "clock repairing", or "horology supplies", including the quotes, and look up some of their suppliers. There is probably one in your, or a nearby, city. Leaf springs can also be made from the steel strip used to bind up large crates and packaging. This steel strapping comes in a variety of shades (strength), thickness and widths, and is usually discarded as waste. The thinner material is usually painted black and thicker material is usually painted green. A bundle of 12 green painted strapping 0.7mm (thick) x 16mm (wide) x 100mm (long) will give a reasonable spring with approximately 20kg load. With straps to fix leaves. Note the top leaves drilled and notched. The desired spring size and shape can be achieved by using multiple leaves. The profile is usually built up by having the longest leaf on top, and progressively shorter leaves below. 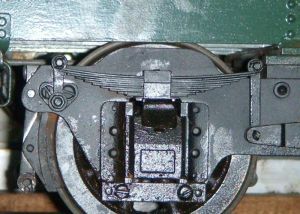 Occasionally this is inverted, or a special spring is required. If, after assembly, a scale size or appearance spring is too strong, the spring rate must be reduced, and without affecting the scale appearance. This can be achieved by inserting 'dummy' soft flexible leaves between the active (steel) leaves as a non-active filler leaf to build up the bulk of a spring without adding any significant additional strength. Copper or plastic dummy leaves can be used. Varying the number of steel and dummy leaves allows you to produce the required height and deflection characteristics of the spring bundle while retaining a scale appearance. Plastic crate strapping can used as a 'dummy' leaf, and is readily available and cheap (free!). The springs should be hardened and tempered as the final stage. After all the leaves are made, each metal leaf should be heat treated before final assembly into the complete spring. Anneal the steel strip raw material. [Heat to approx 800~850°C (cherry to bright red) and allow to cool s-l-o-w-l-y in air]. Cut, machine and form and shape the individual leaves. Test assemble the complete spring assembly. When satisfied, disassemble the spring again and harden the leaves (individually). [Heat to approx 820°C (bright red) and quench in oil]. Clean the surface with steel wool or similar to see the colours clearly when tempering (next). Temper the leaves. [Heat to approx 320°C (dark blue/grey) and quench in oil]. Clean the leaves, and paint or apply final finish if desired. Central rivet to fix leaves (hidden). End of top leaves notched and rolled. 142 Text and photos Copyright © 2006-2019 SMEX, All rights reserved.